Organized at Indianapolis, Ind., March 11, 1862, and mustered in July 5, 1862. Left State for Harper's Ferry, W. Va., July 5. Attached to D'Utassy's Brigade, White's Division, Army of Virginia, to September, 1862. Miles' Command, Harper's Ferry, September, 1862. Camp Douglas, Ill., and Indianapolis, Ind., to April, 1863. District of Central Kentucky, Dept. of the Ohio, to June, 1863. 2nd Brigade, 4th Division, 23rd Army Corps, Army of Ohio, to July, 1863. 2nd Brigade, 1st Division, 23rd Army Corps, to August 1863. 1st Brigade, 4th Division, 23rd Army Corps, to October, 1863. 2nd Brigade, 4th Division, 23rd Army Corps, to November, 1863. 2nd Brigade, 1st Cavalry Division, Dept. of Ohio, to December, 1863. Artillery, 2nd Division, 9th Army Corps, Dept. of Ohio, to April 1864. Artillery, 3rd Division, 23rd Army Corps, to December, 1864. Artillery, 2nd Division, 23rd Army Corps, Army of Ohio, to February, 1865, and Dept. of North Carolina to June, 1865. SERVICE.--Duty at Martinsburg and Harper's Ferry, W. Va., until September, 1862. Defense of Harper's Ferry September 13-15. Bolivar Heights September 14. Surrendered September 15. Paroled September 16 and sent to Annapolis, Md., thence to Camp Douglas, Chicago, Ill. Duty at Camp Douglas and Indianapolis, Ind., until March, 1863. Ordered to Louisville, Ky. Pursuit of Morgan in Kentucky April, 1863. Action at Paris, Ky., April 16. Pursuit of Morgan through Indiana and Ohio July 1-26. New Lisbon, Ohio, July 26. Paris, Ky., July 29. Burnside's Campaign in East Tennessee August 16-October 17. Winter's Gap August 31. Actions at Athens, Calhoun and Charleston September 25. Philadelphia September 27 and October 24. Knoxville Campaign November 4-December 23. Loudon November 14. Lenoir November 14-15. Campbell's Station November 16. Siege of Knoxville November 17-December 5. Kingston November 24. Bean's Station December 10. Blain's Cross Roads December 16-19. 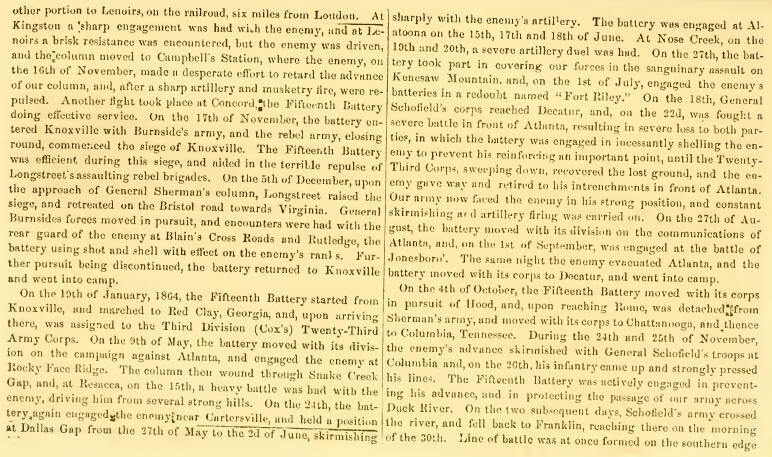 Duty at Knoxville until January 19, 1864. March to Red Clay, Ga. Atlanta Campaign May 1-September 8. Demonstration on Rocky Faced Ridge May 8-11. Battle of Resaca May 14-15. Cartersville May 20. Operations on line of Pumpkin Vine Creek and battles about Dallas, New Hope Church and Allatoona Hills May 25-June 5. Operations about Marietta and against Kenesaw Mountain June 10-July 2. Lost Mountain June 15-17. Muddy Creek June 17. Noyes Creek June 19. Cheyney's Farm June 22. Olley's Farm June 26-27. Assault on Kenesaw June 27. Nickajack Creek July 2-5. Chattahoochie River July 5-17. Siege of Atlanta July 22-August 25. Utoy Creek August 5-7. Flank movement on Jonesboro August 25-30. Battle of Jonesboro August 31-September 1. Lovejoy Station September 2-6. Pursuit of Hood into Alabama October 1-26. Nashville Campaign November-December. Columbia, Duck River, November 24-27. Columbia Ford November 28-29. Battle of Franklin November 30. Battle of Nashville December 15-16. Pursuit of Hood, to the Tennessee River, December 17-28. At Clifton, Tenn., until January 16, 1865. Movement to Washington, D.C., thence to Fort Fisher, N. C., January 16-February 9. Operations against Hoke February 11-14. Fort Anderson February 18-19. Town Creek February 19-20. Capture of Wilmington February 22. Campaign of the Carolinas March 1-April 26. Advance on Goldsboro March 6-21. Occupation of Goldsboro March 21. Advance on Raleigh April 10-14. Occupation of Raleigh April 14. Bennett's House April 26. Surrender of Johnston and his army. Duty at Greensboro, N. C., till June. Ordered to Indianapolis, Ind., and there mustered out June 30, 1865.